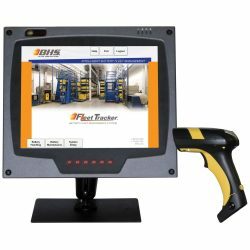 The BHS Fleet Tracker™ is a leading battery fleet management system used by corporate managers, battery room supervisors, and Operator Aboard Battery Extractor operators. Fleet Tracker™ uses the latest technology to provide a detailed look into an organization’s battery inventory to help managers reduce maintenance costs, improve profitability, and increase productivity. Fleet Tracker’s First In, First Out battery tracking directs users to the battery that has charged the longest. The tracker’s use of centralized data reduces battery changeout times, promotes proper maintenance of batteries, and reduces the number of batteries and chargers an operation needs by more efficiently utilizing existing equipment. The touch-screen computer interface and lightweight barcode scanner allow a manager to access comprehensive information without hooking up to batteries or chargers. Layered security, logins, and activity permissions keep the system secure. The Fleet Tracker™ can produce detailed reports and easily decommission and recommission batteries. Experience gains in productivity and efficiency with the BHS Fleet Tracker™. Contact our sales team at 1.800.BHS.9500 to learn more or to find a local dealer. Fleet Tracker™ can be installed to store information on a wireless network. This allows two Operator Aboard Battery Extractors to share information and track batteries in the same fleet. The reports can also be viewed from a remote computer.